BRAVE villagers opposed to Ronda’s controversial Los Merinos golf course scheme are holding a symbolic funeral. Despite Junta officials admitting they are impotent to stop the ‘illegal’ scheme, locals in Cuevas del Becerro hope that hundreds will turn out to support their protest this weekend at their town hall. The villagers made international news last year when they held a general strike in opposition to the scheme which they believe will destroy the area. The scheme is going ahead, despite a stop order from the Junta on environmental grounds and investigations by the courts and the European Union. Developers have carved dozens of roads and pulled-up hundreds of protected oak trees to create the double golf course scheme with 800 houses and three luxury hotels. The mayor of Ronda is now being taken to court by the IU party for giving permission to begin construction without the necessary environmental permits. In particular it still has no agreement for water. According to sources, this has not stopped delegates behind the scheme beginning the process of selling off plots. The Olive Press can reveal that part of it is being backed in the UK by multi-millionaire businessman David Harrison, who is estimated to be worth up to 100 million euros from a string of successful companies. Thousands of villagers in the Serrania de Ronda fear that their water supply will be lost if the Los Merinos scheme goes ahead. They are backed up by scientific reports which show that the golf course sits above an aquifer feeding the villages of both Cuevas and Arriate, as well as La Cimada and Los Prados. “We will fight until the death to stop this destructive scheme,” said former village mayor Isobel Teresa Rosado, who will be at the protest. 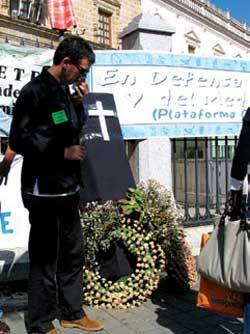 The burial protest was announced at a heated meeting with the Junta’s boss for Malaga Jose Luis Marcos on Saturday. Hundreds of supporters filed into a small hall to hear him admit that he felt impotent to act against the “illegal” development. He said he sympathised with the protest and that the Junta was awaiting a decision from the Supreme Court to stop the works. Last year, the Junta lost in the Malaga courts in an attempt to bring a temporary halt to the project. “Justice is admittedly slow,” he said. “We were as surprised as everyone when the judge last year allowed the developers to continue working. However, opponents to the scheme told him that there must be a failure in the justice system if it was allowed to go on. Spokesman for Ecologistas en Accion Juan Terroba said: “This is a classic example of developers doing exactly as they please. In recent weeks they have even been using explosives on the land, in an area where some of the world’s rarest Bonelli’s eagles live.